The 2019 Ontario Hockey League (OHL) Priority Selection, presented by Real Canadian Superstore, took place Saturday, April 6th, 2019 and the Firebirds selected 15 players including Brennan Othmann with the second-overall pick. The annual Priority Selection features 300 picks over 15 rounds. 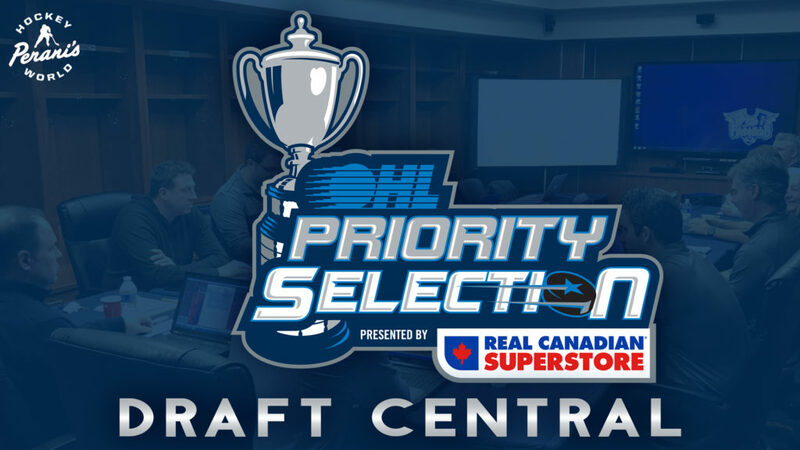 For the 12th straight year the OHL Priority Selection Draft Show showcased the first three rounds through a live video stream online including live pick-by-pick results. North American players that reside in the province of Ontario, the states of Michigan, Pennsylvania and New York and other designated U.S. states east of the Mississippi River born January 1, 2000 through December 31, 2003 were eligible for selection through the 15 round process this year. 1/3 Ryan McLeod C 6.01.5 173 9/21/99 Toronto Marlboro Mississauga, Ont. 4/64 Samuel Duchesne LD 6.01.75 165 5/29/99 Toronto Marlboro Brampton, Ont. 4/74 Kyle Keyser G 6.00 168 3/8/99 Detroit Victory Honda Cape Coral, Fla.
5/84 Evan Barratt C 5.11 170 2/18/99 Team Comcast Bristol, Penn. 7/124 Håkon Nilsen RD 6.01 190 2/4/98 Detroit Little Caesars New Baltimore, Mich.
7/133 Jack Phibbs LW 5.11.5 165 3/5/99 Southern Tier Admirals Cayuga, Ont. 8/144 Wyatt Bongiovanni C 5.11 170 7/24/99 Detroit Honeybaked Birmingham, Mich.
9/164 Kyle Waters RW 6.03 179 3/27/99 Halton Hills Hurricanes Orangeville, Ont. 10/204 Andy Nedeljkovic RW 5.10 188 1/18/99 Detroit Victory Honda Canton, Mich.
11/204 Matt Hohl RD 6.01 165 7/26/99 St. Louis Blues Fenton, Mo. 12/224 Drayton Duckett LW 5.11 185 5/2/99 Waterloo Wolves Waterloo, Ont. 12/233 Lanny Korbee G 6.00 188 5/14/99 Toronto Jr. Canadiens Toronto, Ont. 13/244 Josh Rettinger LD 5.10 155 6/3/99 Mississauga Rebels Oakville, Ont. 14/264 Liam Walsh LW 5.10.25 164 7/14/99 Detroit Victory Honda Bridgeville, Penn. 15/284 DeVon Fields RD 5.10.75 194 10/25/99 Detroit Little Caesars Detroit, Mich.
1st / 7th William Bitten C 5.09.25 146 7/10/98 Ottawa 67’s Gloucester, Ont. 2nd / 27th Nicholas Caamano RW 5.11.5 165 9/7/98 Hamilton Bulldogs Ancaster, Ont. 5th / 99th Jacob Collins LW 6.00.5 173 4/29/98 Ottawa Valley Renfrew, Ont. 6th / 107th Rylee St. Onge LW 5.09 155 4/22/98 Niagara North St. Catharines, Ont. 8th / 147th Alex Semandel LD 6.03 185 5/23/98 Chicago Mission Waunakee, Wisc. 9th / 167th Dane Johnstone C 5.09.75 174 3/4/98 Elgine-Middlesex St. Thomas, Ont. 11th / 207th Noah Lalonde C 5.08.5 172 3/22/98 Detroit Honeybaked Macomb, Mich.
12th / 227th Vasili Kolias LD 5.09 145 2/8/97 Chicago Mission Schaumburg, Ill.
13th / 247th Brendane Devane LD 6.03 187 1/29/98 Toronto Red Wings Mississauga, Ont. 14th / 267th Will Hunter RW 5.11.75 185 9/12/98 Toronto Marlboro Toronto, Ont. 15th / 287th Carleton Boothe G 5.08.5 146 8/5/98 Toronto Red Wings North York, Ont. 3rd / 57th Cullen Mercer C 5.11 168 5/2/97 Huron Exeter, Ont. 4th / 73rd Bryce Yetman RW 6.00.75 147 2/21/97 Whitby Whitby, Ont. 4th / 76th Zach Bowman G 5.10.5 147 7/31/97 Niagara North Niagara Falls, Ont. 5th / 87th Laine McKay C 6.00.25 175 1/4/97 TB Kings Thunder Bay, Ont. 5th / 93rd Alex King C 6.00 163 7/18/97 Detroit Compuware Taylor, Mich.
6th / 114th Liam Dunda LW 6.03.25 215 9/15/97 Don Mills Grimsby, Ont. 7th / 136th Alex Di Carlo LD 6.02 189 3/25/97 Vaughan Woodbridge, Ont. 8th / 156th Dakota Joshua C 6.00 162 5/15/96 Detroit Honeybaked Dearborn, Mich.
9th / 174th Alex Morin LD 5.09.75 177 12/5/97 SSM Thunder Sault Ste. Marie, Ont. 10th / 196th Aaron O’Neill C 5.10.5 167 5/5/97 TPH Thunder Franklin, Tenn.
12th / 236th Tyler Sensky LD 5.11 172 2/27/97 Detroit Compuware Canton, Mich.
13th / 248th Keegan Ward F 6.02 169 1/9/97 West Michigan Galesburg, Mich.
13th / 256th Adam Parsells RD 6.04 175 1/3/97 Wausau Wausau, Wisc. 15th / 296th JC Thivierge RD 6.01 164 7/25/97 Hamilton Bulldogs Welland, Ont.